48 W INTER 2018 PracticeLink.com Our Mission: We, Trinity Health, serve together in the spirit of the Gospel as a compassionate and transforming healing presence within our communities. trinity-health.org/physician-postings PARTNER WITH TRINITY HEALTH Explore the Possibilities Trinity Health is one of the largest multi-institutional Catholic health care delivery systems in the nation. Serving people and communities in 22 states from coast to coast with 92 hospitals, and 120 continuing care locations — including home care, hospice, PACE and senior living facilities - that provide nearly 2.5 million visits annually. 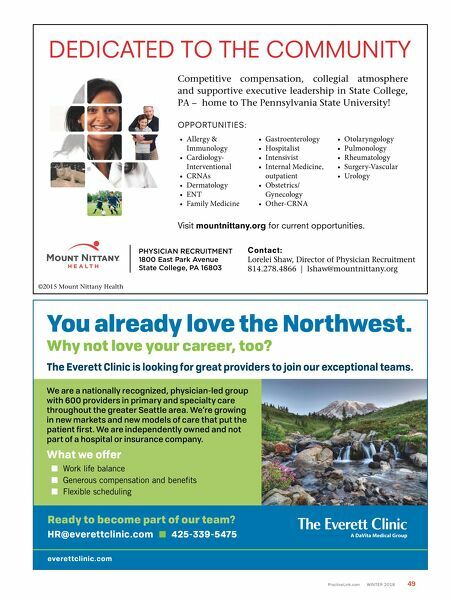 If you would like to be part of the Trinity Health system, we encourage you to explore the possibilities. 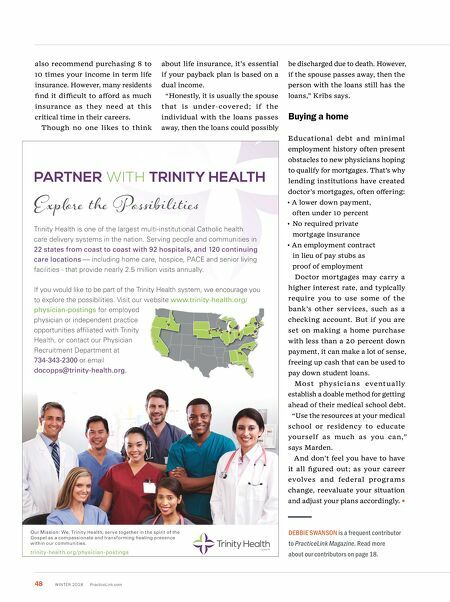 Visit our website www.trinity-health.org/ physician-postings for employed physician or independent practice opportunities affiliated with Trinity Health, or contact our Physician Recruitment Department at 734-343-2300 or email docopps@trinity-health.org . also recommend purchasing 8 to 10 times your income in term life insurance. However, many residents find it difficult to afford as much insurance as they need at this critical time in their careers. Though no one likes to think about life insurance, it's essential if your payback plan is based on a dual income. "Honestly, it is usually the spouse that is u nder- covered; i f the individual with the loans passes away, then the loans could possibly be discharged due to death. However, if the spouse passes away, then the person with the loans still has the loans," Kribs says. Buying a home Educational debt and minimal employment history often present obstacles to new physicians hoping to qualify for mortgages. That's why lending institutions have created doctor's mortgages, often offering: • A lower down payment, often under 10 percent • No required private mortgage insurance • An employment contract in lieu of pay stubs as proof of employment Doctor mortgages may carry a higher interest rate, and typically require you to use some of the bank's other services, such as a checking account. But if you are set on making a home purchase with less than a 20 percent down payment, it can make a lot of sense, freeing up cash that can be used to pay down student loans. Most physicia ns event u a l ly establish a doable method for getting ahead of their medical school debt. "Use the resources at your medical school or residency to educate yourself as much as you can," says Marden. And don't feel you have to have it all figured out; as your career evolves and federal programs change, reevaluate your situation and adjust your plans accordingly. DEBBIE SWANSON is a frequent contributor to PracticeLink Magazine. Read more about our contributors on page 18.